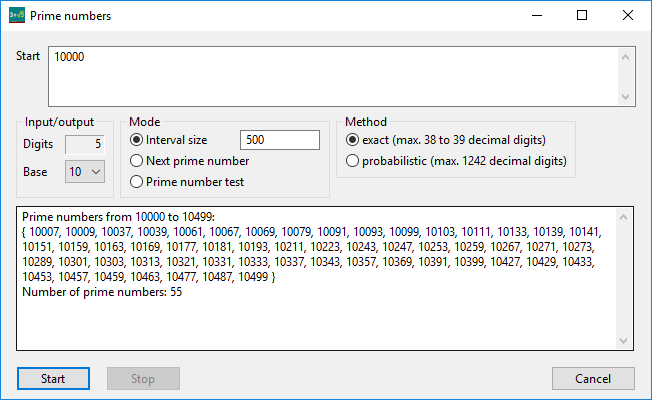 With the prime number generator you can easily calculate small and large prime numbers. Prime numbers with up to 1242 decimal digits can be calculated. In the interval mode prime numbers within a given interval can be calculated and counted so that a prime number table can be easily created. With the prime number tester a single number is checked if it is prime. Using the exact method prime numbers are calculated the classical way by searching all divisors up to the square root. Using the probabilistic method the prime number test of Solovay-Strassen is adopted.